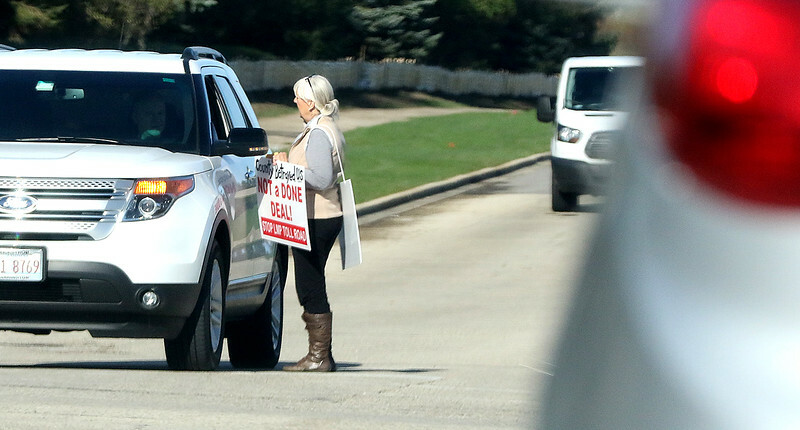 H. Rick Bamman - hbamman@shawmedia.com JoAnn Fritz of West Dundee speaks with a motorist Monday, April 17, 2017 on Longmeadow Parkway at the Sleepy Hollow Rd. intersection in Algonquin. Fritz was protesting the project that includes building a four-lane, 5-mile toll road and a four-lane Fox River bridge crossing to try to reduce traffic congestion in northern Kane County. Pavement removal and widening work will start in sections including about 1,500 feet north and south of Randall Road and Longmeadow Parkway; north and south of Sleepy Hollow Road and Longmeadow Parkway; and on Longmeadow Parkway from Randall Road to east of White Chapel Drive. H. Rick Bamman - hbamman@shawmedia.com A worker from Plote Construction grades the right of way Monday, April 17, 2017 on the north side of Longmeadow Parkway east of Stonegate in Algonquin. Pavement removal and widening work started in sections including about 1,500 feet north and south of Randall Road and Longmeadow Parkway; north and south of Sleepy Hollow Road and Longmeadow Parkway; and on Longmeadow Parkway from Randall Road to east of White Chapel Drive. JoAnn Fritz of West Dundee speaks with a motorist Monday, April 17, 2017 on Longmeadow Parkway at the Sleepy Hollow Rd. intersection in Algonquin. Fritz was protesting the project that includes building a four-lane, 5-mile toll road and a four-lane Fox River bridge crossing to try to reduce traffic congestion in northern Kane County. Pavement removal and widening work will start in sections including about 1,500 feet north and south of Randall Road and Longmeadow Parkway; north and south of Sleepy Hollow Road and Longmeadow Parkway; and on Longmeadow Parkway from Randall Road to east of White Chapel Drive.